About Me | La Rosilla - Lifestyle and food. My name is Lynsey Drake, I relocated from Blighty to Solano, in the rural Montes de Malaga, Axarquia in Andalucia, 14 years ago with my family, lock, stock & barrell to ….LIVE THE DREAM ! What’s my dream? What do I dream about? I am commonly known as a ‘Cook book whore’ I read them as novels, always have to have the latest. I have books for display only and those with battered corners and pages stuck together with dough, these I couldn;t live without. I collect recipes and ingredients and inspiration from where I go. Sharing recipes with others from around the world, learning tips and tricks from my visitors too. I’m often heard to be saying, I’m doing ‘a Jamie’ or ‘a Delia’ and loved to be known as the ‘Domestic Goddess’. I have eaten in some of the worlds finest eateries, along with rustic street food vendors and beach chiringuitos. Each place creating ‘foodie’ memories and days filled with happiness. Our natural, classical ‘Finca’ La Rosilla, sits snuggly, on our mountainside, nestled in our almond and olive orchard. The weather, seasons and terrain enable us to appreciate nearby and home-grown produce throughout the entire year, together this with gourmet traditions and recipes from the Axarquia & Andalucia and we’re in foodie paradise. The pace of life feels like a bygone era. Ancient traditions in farming and agriculture are still going strong. Peace and tranquillity guaranteed. 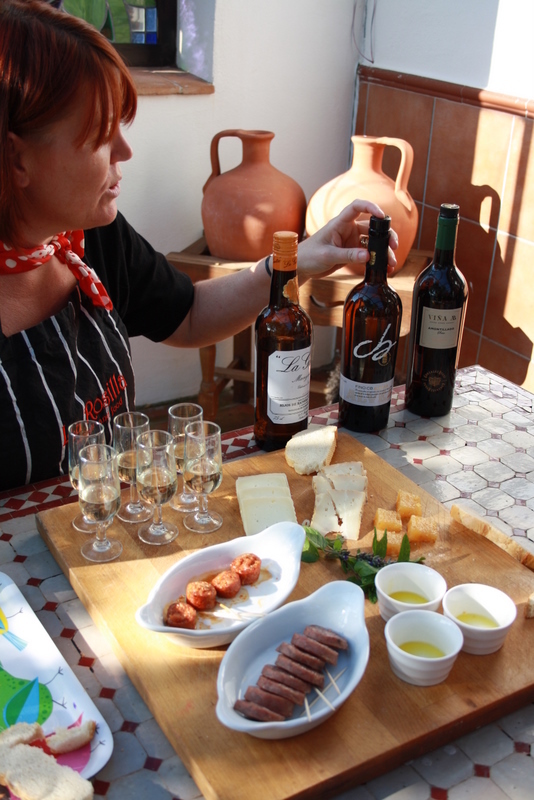 Presently at La Rosilla we offer Cooking and Culture Classes, Gourmet Tours and Event Catering in our general vicinity of the Axarquia, Andalucia. Visitors and guests come from all places throughout the world, to encounter an essence of our provincial way of life and a festival of Andalucian culture. They relax with a view to die for, breath in the natural air, appreciate a place at our table and leave as companions. I can promise homemade food prepared and served with love, and an ambiance to go with it at La Rosilla Supper Club & Chef’s Table’ restaurant. I can promise original, beautifully presented dishes. I can promise service second to none with my Event & Private Party Catering. It’s a family affair, and children are welcome and encouraged to try and taste new flavours.